Perhaps I have arrived ... finally. Sometimes I feel like I've lived so many lives. And occasionally, they collide, in the most unexpected ways. On Sunday morning, I was wandering in from the car ... back from the babysitting gig in the city, when I bumped into an old friend from my days spent as an Airforce officer's wife. There was Bridget, walking out from bringing Communion to my Dad, who can no longer attend church. It was so good to see her. She had been an officer's wife too. We had long conversations, back then, about our real lives ... before those years we spent living on Base Woodbourne. These days, she lives just along the road, with her family (she kept the same husband :-) ) and so, we have plans. One day soon, after Christmas and New Year, we shall have some of our long conversations again. Meanwhile, I went back out into the garden with my camera tonight ... and remembered that my camera is the other place where Joy hangs out. I felt like I was losing Joy, and I had no idea what to do, since Genova is about 20,000kms from here. 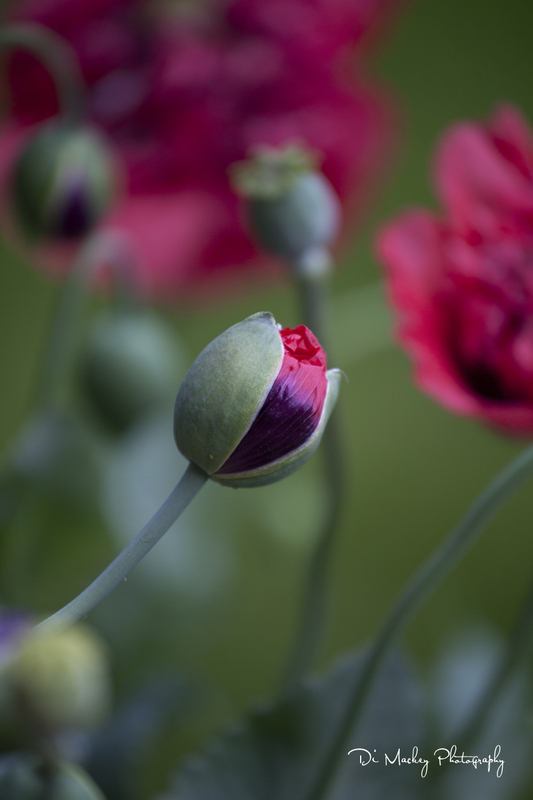 I discovered so many photographs, unprocessed, there on the camera card. That last storm in Genova, Ben Ohau with Dave and Jude, and Dad's Garden. Perhaps I have finally arrived, here in this life ... I'm taking photographs again, with my camera. I wanted to store this piece that talks of the hardest part of traveling. I need to think about it. Travel changes a person or, perhaps, in my case, it turned me into someone I recognised. I was always curious, I love meeting new people, learning how they live, hearing their stories ... out here in the world I wander, I get to meet others like me. I read this quote this morning, and thought ... really? I always give my attention. I am curious, and genuinely interested in people. Is this so special? Then I remembered the phenomena of talking with political folk out at social events back in Belgium. Their attention was on their phones, on checking out who else was in the room, and back to whoever they were talking with, and off again, round the room. I felt like I was swimming with sharks, in some ways. They were hunting. Their attention was everywhere and nowhere. But this sense of dislocation Kellie writes of ... I posted her piece over on Facebook and watched as various friends shared or liked it. Yes. They all knew that feeling. I haven't returned home, for longer than 5 weeks. It is something I think about ... how that return would be. Would a dog, and a beach or a lake somewhere close by ... old friends, and new, be enough. I don't know but anyway, I have located this article in a place where I can return to it when needed. The best random car radio I've heard anywhere in the world so far was between Rijeka, Croatia and Budapest, Hungary. I guess it's music I know so perhaps there was some nostalgia from the 70s and 80s involved but honestly, excellent music for that 4+ hour journey. If you have a rental car that doesn't charge your GPS as you travel, chances are you might have some challenging experiences when attempting to reach your destination. First hint of trouble was in Verona. Many people were approached for directions to our final destination in the heart of the ancient city. Rijeka, and voila, although we tried to leave the GPS alone and simply rely on it for the complicated city-leaving and arrival parts ... the GPS battery started to die about one kilometre from our destination. About then we became suspicious of the coincidence of the destination flag appearing and the battery warning appearing. Maybe it had some kind of bug in the machine. Budapest ... about a kilometre from our destination, having really rested the GPS, up came the battery warning along with the destination flag. We were caught in a long traffic jam on the other side of the river. Julie laughed. I was not amused. We crossed over into Austria yesterday and barely used the GPS. No flag appeared as we neared our Vienna destination ... the 'bug' in the GPS suspicion is over. The rental car has a faulty charger. We shall proceed with caution, relying mostly on the big highway signs. It's Trieste today and a longer journey that will take us through Slovenia. But back to other things learned ... be clear on destinations programmed into the GPS. We had hoped to call in for lunch in Zagreb but managed to miscommunicate on programming that idea in. We passed by and realised, after a conversation, that we love the journey as much as the destinations so we continued on. 4+ hours of road-tripping was a really excellent Plan B, although we did detour to a secondary road and visit a lake before leaving Hungary. Budapest, brilliant city. Loved it but more to follow in another post. Julie's handbag. The one that sits behind us on the floor of the backseat. Yes Julie, it is a marvellous bag that holds so much but ... let's be sure that I pull out your sunglasses, your normal glasses, your lip balm, your iPod music player (although that's more useful if charged), and every other thing I have had to grapple with on the road trip while you have driven us across Europe. But okay, yes, perhaps it would have lacked a certain sense of achievement had we been that organised. Air B&B, a great way to travel. We've stayed in local homes and apartments, met excellent people that I have to write more about when I have all the information and life isn't about the journey. I'm writing this from a student flat in Vienna, where one of our hosts is a lovely Croatian guy studying architecture. He was just in Rijeka last week. They are a delightful couple and we're glad that we did it. Julie organised it all and she has made me a convert because I do love meeting people where ever I go. It's another big old apartment complex with at least two inner courtyards. 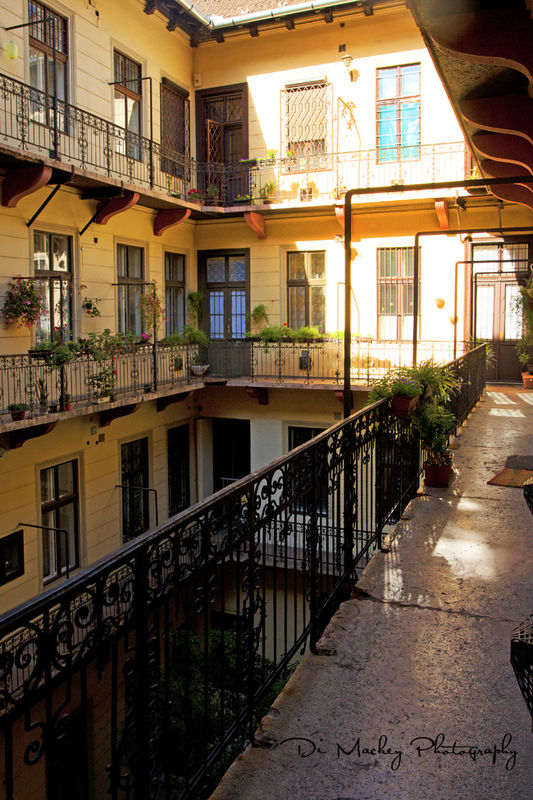 The Budapest apartment was my favourite so far ... directly behind the opera house and truly exquisite, inner courtyard, beautiful ironwork on the inside and that delicious sense that you are experiencing something of an everyday life in each place. Learned while living in Istanbul ... always look for cafes and restaurants that are full of locals. Do not be tempted to do anything else. If you know someone, all the better, ask them where to eat. We have eaten divinely while traveling. It's been less about expensive and upmarket and so very much about good local food. Hungary has been my absolute favourite so far. If in doubt about where to eat, stop someone who looks like they might eat in places you would like to eat in. Asking politely worked every time. Wines ... some countries you can barely go wrong, other countries have a wine culture to be explored with caution. Perhaps that's as specific as I'll get but I do love countries where I can find my beloved Italian red wines. We enjoyed this Croatian red wine. And were really impressed by Hungarian red wine ... absolutely lovely. Thanks to Jennifer. Men from Manchester on stag weekends in Budapest ... very friendly, quite naughty but with a lovely humour that meant we always wandered away on laughing. We met 3 groups on our second night there. Yes, they made us laugh. Croatians in Rijeka speak beautiful English. We were told by the lovely wine guy that they start studying it in fourth grade. Hungarians in Budapest also speak beautiful English. Maybe that's enough for this post. I wanted to finish up with a photograph of the most divine fish and chips I've had any place so far ...located on Andrássy Avenue, we would absolutely recommend The Bigfish restaurant because their cod and chips were sublime. 'It is also famous as one of the few ancient cities that can now be seen in almost its original splendour, because unlike Pompeii, its burial was deep enough to ensure the upper storeys of buildings remained intact, and the hotter ash preserved wooden household objects such as beds and doors and even food. I found myself fascinated by the ruins of Herculaneum. 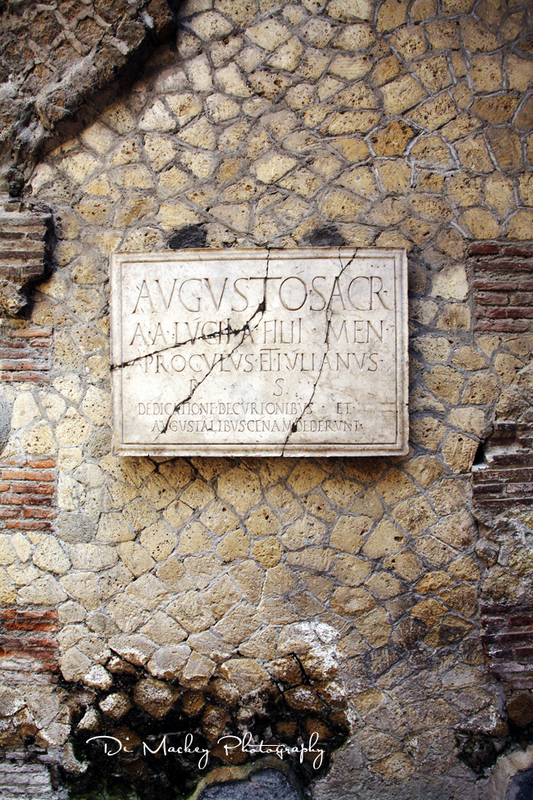 Destroyed during the eruption of Mount Vesuvius back in 79 A.D, there is still so much that is as it was then. I was only there for a few hours but it remains as a memory of immensity ... both in time and space.